“When are you going back to school?” asked the bartender, calling over her shoulder from across the bar. “NEVER!” I replied, with an evil laugh. Of course she wasn’t talking to me, she thought I was somebody else, some bright young woman with her future ahead of her who will be going back to school within the month. Everybody is going off somewhere…to school; to a new, real, job; to a trip abroad. And I’m just sitting here, sitting. I’d like to go back to school, but it would be frivolous at my age; I should get a new real job, but I don’t really want to, if I’m being honest. I’d love to go on a trip abroad, but I’ve got kids and a dog and no money. I’ve said it before and I’ll say it again: I’m not great with change, and I’m genuinely content with things the way they stand. Sometimes, though, it’s discombobulating to take a step back and see how many decisions have already been decided–almost without me knowing I was making them. We own a house, we have as many children as I ever wanted, I can’t imagine ever leaving this town. Of course we have dreams, we talk about doing something else. We’re just about ready to launch our back-up plan of moving to Provence and raising goats and writing children’s books. I’m thinking of moving to Uraguay to form a film collective with whoever has been making the beautiful films I’ve seen from that area. I fully intend to move to Barcelona and become a secret street artist. I’d like to be a polyglot troubadour like Manu Chao, and gallivant to Brazil and Algeria to make huge wine-filled dinners with scores of fascinating friends from all over the world. It’s only a matter of time, really, before I travel back in time to 30s or 60s Paris, to make movies with Renoir or Godard. Just one or two things to put in order, first, and we’re off. This is my summer of cherries! I’m cherry-obsessed. I’ve always been a raspberry fan, but I have to admit, this summer I’m very nearly ready to declare the cherry as my favorite fruit. I’m especially obsessed with the combination of cherries, almonds, and chocolate. So I warn you in advance I’ve tried lots and lots of combinations, and I plan to tell you about them all! ALl of them! I thought it might be fun to make cookies with fresh cherries. The cookies turned out very soft, like little cakes. But tasty–fresh and juicy. Here’s Manu Chao with Denia. We’ve been playing this album for Malcolm lately, because I think Manu Chao might be a satorial soul mate for our Malcolm. In a food processor, process the soft butter with the sugar until they’re combined and fluffy. Add the vanilla, almond essence and egg, and process again till smooth. Add the almonds and process until they’re quite finely ground, the add the flour and salt and process till smooth. Add the cherries and process briefly…you want to have some chunks of cherries left, but the batter will turn pink. Add the chocolate chips and process for about a second. Lightly butter large baking sheets. Drop the batter by spoonfuls, leaving some space in between. Bake about 10 minutes until they’re just brown on the bottom. Move to a rack to cool. They’ll stay very soft, but try to keep them in a dry place. 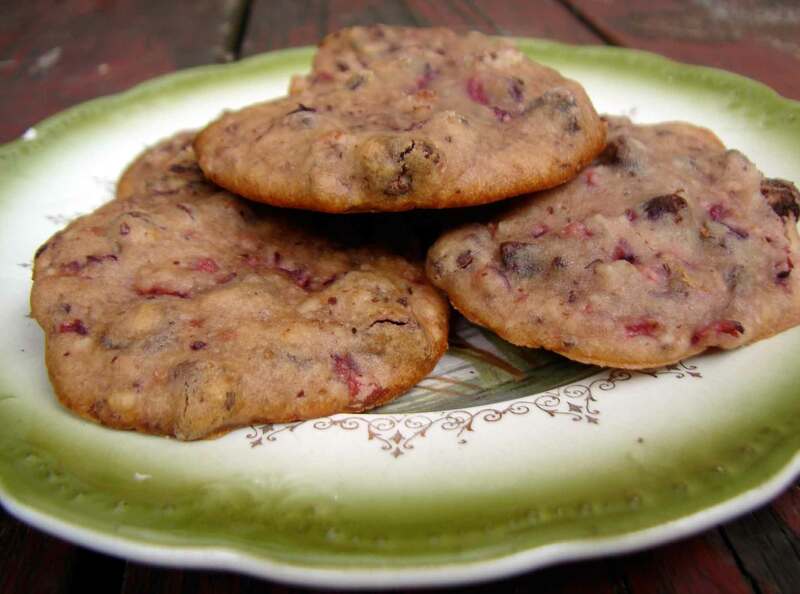 This entry was posted in cake, chocolate, cookie, dessert, recipe, Uncategorized and tagged almond chocolate chip cookies, cherry chocolate almond, fresh cherry cookies by Claire. Bookmark the permalink.